This easy to use handheld Tambourine can withstand some vigorous drumming activity. This instrument produces a great warm sound which goes well with a lot of other church based instruments. Not only is the wooden handle extremely durable it’s comfortable and easy to grasp whilst hitting the Tambourine. 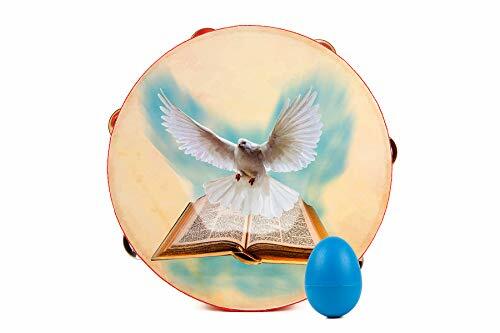 Included is the bonus egg shaker which will go along great as you use the Tambourine. The PVA skin is excellent quality and soft on your hands and will work well as long as used properly and not to excess. The symbols or jingles are securely fastened into the wooden handle and will provide excellent sound quality which is great for worshipping. The images on the drumhead skin is of great quality and very vivid. Your friends will be extremely jealous of how great these tambourines look. If you love having fun, love church, religion, God and have a strong faith or enjoy praising you will love this tambourine. The tambourine is very easy to play for many hours and is easy to use on your arm, wrist, hands and fingers. Therefore, it’s perfect for the kids, children and teenagers as well as adults.